A U G U S T 2 0 1 5 O U T P A T I E N TS U R G E R Y. N E T 2 3 O rthopedic procedures hurt. A lot. 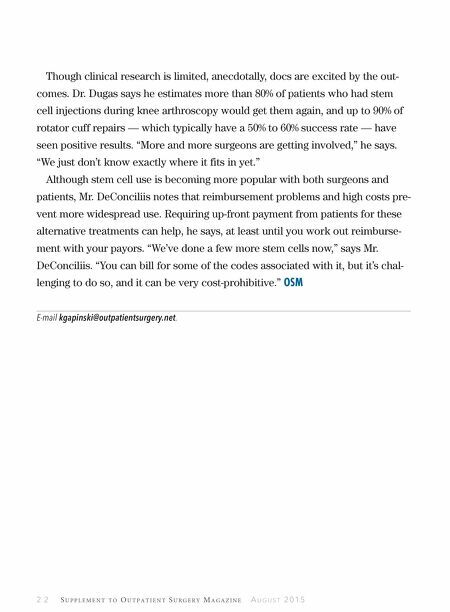 Zeroing in on a pain man- agement plan that lets patients recover quickly is essential to positive case outcomes. When it comes to sending patients home comfortable and happy after joint repairs and replacements, keep these 5 key points in mind. Why you should ditch the opiates — and what to use instead. 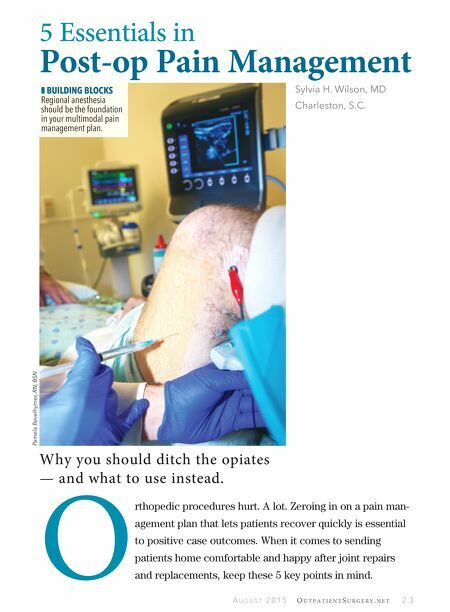 5 Essentials in Post-op Pain Management z BUILDING BLOCKS Regional anesthesia should be the foundation in your multimodal pain management plan. Pamela Bevelhymer, RN, BSN Sylvia H. Wilson, MD Charleston, S.C.